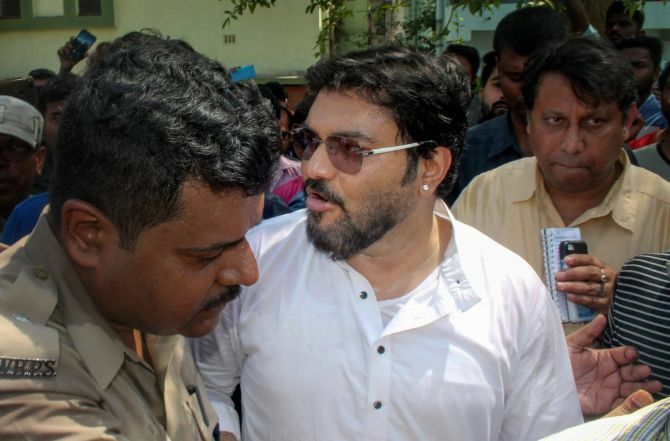 Union minister Babul Supriyo and a senior West Bengal Bharatiya Janata Party leader were on Thursday stopped by police from entering the Asansol-Raniganj area, where situation continued to remain tense after violence erupted over a Ram Navami procession. Internet services remained suspended and prohibitory orders under Section 144 of the Code of Criminal Procedure were clamped in the area, following clashes between two groups on Sunday and Monday over a Ram Navami rally at Raniganj, the police said. However, no fresh incident of violence was reported from the area since Wednesday night, the police said adding that the situation was 'under control'. Chief Minister Mamata Banerjee on Thursday held a high-level meeting at the secretariat after her return from Delhi. Chief secretary, home secretary, Director General of Police and ADGP (law and order) were present at the meeting. Banerjee did not comment on the situation at Asansol-Raniganj. Supriyo, the MP from Asansol, tried to enter the Railpar area in Paschim Bardhaman district, where police stopped his car, citing security reasons. A group of people shouted slogans against the minister and demanded that he immediately leave the area. TV channels showed him engaged in a verbal spat with police personnel, who had surrounded his vehicle. "As a public representative, I have every right to visit my constituency, especially when people are in trouble. It is my duty. But the police is saying I won't be allowed to go as Section 144 is imposed in the area. Being a minister, I cannot violate rules," Supriyo said. He said that he would inform Prime Minister Narendra Modi and Home Minister Rajnath Singh about the incident. Supriyo claimed that only the deployment of central forces could bring back peace to the area as locals did not have faith in the police. The minister, earlier this week, had blamed inaction on part of the police for Sunday's violence over Ram Navami celebrations in Raniganj, neighbouring Asansol. When asked, the police did not immediately confirm if complaints were lodged against the Union minister. State BJP Mahila Morcha president Locket Chatterjee, who was en route to Raniganj, was also stopped by police at Durgapur. In protest, the actress-turned-politician staged a sit-in. State Parliamentary Affairs Minister Partha Chatterjee alleged that the BJP was trying to destroy the communal peace and harmony in the state. "When the police is patrolling the area, why do they want to visit Raniganj? Are they not satisfied after unleashing violence for the last two days," he claimed. Chatterjee, also the TMC secretary general, claimed that Supriyo was seen pushing the on-duty police officers. S N Gupta, a senior police officer, said the situation was under control. He, however, advised the people not to pay heed to any rumour and stay indoors. In all, 60 people were detained in connection with the violence, he said. A district police officer said a contingent of the police and the Rapid Action Force (RAF) were patrolling the area. "There have been no fresh incidents of violence, although Section 144 is still imposed in the area," he said, adding, the situation was still tense. One person was killed and two police officers were injured in the violence that erupted on Sunday and Monday. Senior IPS officers Jawed Shamim, Siddhinath Gupta and Vineet Goyal have been deputed on special duty to bring the situation under control. Governor K N Tripathi has also been advised not to visit Durgapur to see a police officer injured in the violence in Raniganj in view of deployment of police in the area, an official release said on Wednesday.